We currently offer standard delivery to almost every country worldwide via our shipping partners. Have a look at our overview to find the shipping costs for foreign countries. *The mentioned shipping costs to customers from EU-countries include VAT. *** If the day of delivery falls on a Saturday, Sunday or a general public holiday recognized at the place of delivery, the next working day will take the place of such day. **The mentioned shipping costs for customers from European non-EU countries don’t include VAT. The price without VAT will be shown during the order process after entering your billing address. As swiss resident you always must pay fees for a delivery coming from a foreign country: VAT and customs duties. These fees are not included in stated prices and shipping costs and are due to pay by you to a third party at import. When you receive a delivery from a foreign country you pay VAT according to the value of goods, shipping costs, custom fees and customs duty. This tax is payable to the freight forwarder. Shipping costs for deliveries to non-European countries will be calculated during the order process as costs vary from shipping partner to shipping partner. Have a look at our shipping fee calculator, which you find in the shopping cart section, to find out if Athletic Archery also ships to your country. In case your country isn’t listed, drop us an email to support@athleticarchery.com. We are always working on finding new shipping partners for additional countries which help us to keep the costs low for you. By choosing the payment in advance option the deadline for delivery begins on the day after the payment order has been sent to the transferring bank and ends with the expiration of the last day of the deadline. In case of choosing other payment methods the deadline for delivery begins on the following day of the conclusion of the contract (date of purchase) and ends with the expiration of the last day of the deadline. If the last day of the period falls on a Saturday, Sunday or a general public holiday recognized at the place of delivery, the next working day shall be replaced by such day. How long is the average shipping time? The average delivery time is 2-3 working days, or the guide values given in the table for each country. If you order from us in the context of a single order multiple items for which different delivery times apply, we will ship the goods in a common shipment, unless we have agreed otherwise. In this case, the total delivery time for the consignment will apply to the item with the longest delivery time for your order. Please keep in mind that deliveries between and on bank holidays can take longer in exceptions. Does the payment method influence shipping time? Yes. If you choose direct payment (e.g. PayPal), we start processing your order directly on the next working day. If you pick advance payment, we start processing your order as soon as the money is paid into our account. Calculate 1-3 additional working days for this process. Please consider the production time for personalized items. As soon as your payment flew into our account, it takes approximately 10 working days to produce your items and hand them over to delivery. How long does shipping to a foreign country take? Shipping time depends on the local shipping partner. Usually, shipping to European neighbouring countries takes 2-7 working days. Please also consider the production time for personalized items. As soon as your payment flew into our account, it takes approximately 10 working days to produce your items and hand them over to delivery. As soon as we handed your order into delivery, you’ll receive a confirmation email. This email includes a tracking code and a link to the shipping partner’s portal. Enter the tracking code to see your order’s status at any time. For more information, have a look at our Help/FAQs. Many articles in our shop come with details in contrasting colours. For these details, you can pick your favourite colour, therefore individualise your archery sportswear and match it with your bow, string and your arrows’ fletching. So that you can select exactly that colour that matches the one which is already in your quiver we compared our colour palette with the colours available for fletching at the worldwide known manufacturer AAE. Except for red, black, white and special colours such as gold and silver, all colours at Athletic Archery are light fluor colours, also known as neon colours. Please note: Minor colour variations might occur production-related. This overview is supposed to give you the best possible assistance when selecting your colour. You’re not into heavy knit? Then you will love SLOUCH. 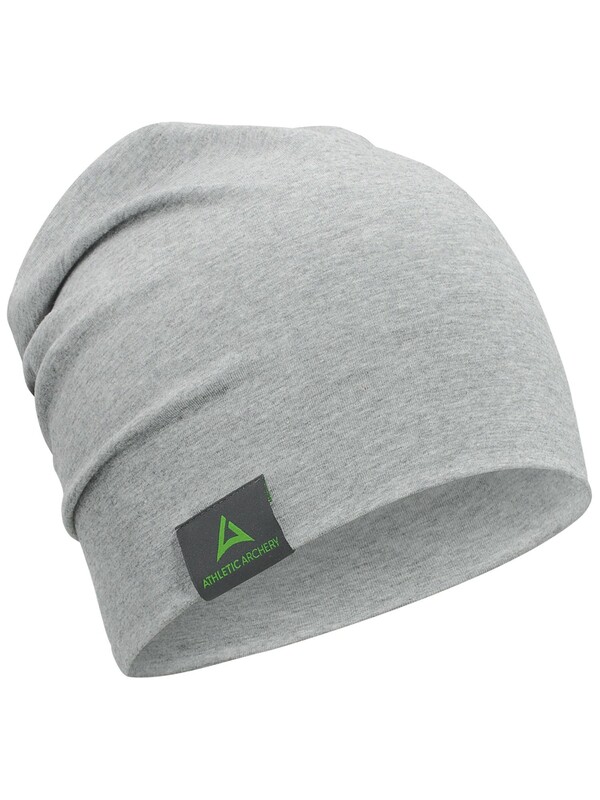 This hat is light, casual, and keeping you warm at the same time. It’s made of cotton micro-knit and comes with a perfect fit. For all the laid-back archers out there: This one is for you. Good to know: Speaking of laid-back archers: Do you already know our hoodie AIM FOR MORE? Have a look! Wash at 30 degrees. Wash dark colours separately. Wash and dry inside out. Re-shape while damp. Dry out of direct heat and sunlight. Do not bleach. Do not dry clean. Do not tumble dry. Do not use fabric softener. Cool iron on reverse.